Celebrate Thanksgiving with Village Volunteers and contribute to a woman’s opportunity for economic freedom and independence. This year we will be dancing for the “Ndori Banana Women’s Fund” which helps women access micro loans to start businesses or enhance their small enterprises in a small village in Western Kenya. 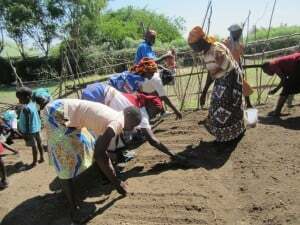 Our goal is to sponsor as many women as we can with $100 seed loans. All loan recipients receive training and assistance with becoming economically stable. The loans are administered locally and when the funds are paid back, they are reinvested with more local women’s projects. This kind of fundraising alliance has touched many people’s lives through the amplifier effect of resources and expertise being passed hand to hand. On the women’s meeting days, their camaraderie is palpable when they dance and sing greetings to one another. Let’s join that spirit this Thanksgiving! We invite you to also keep it local by contributing part or all of your donation to the operational expenses of Village Volunteers, the organization that keeps all of these programs going throughout the year. If you’d like to support both Ndori Banana Fund in Kenya and Village Volunteers in Seattle, you can designate the amount you’d like to go to each on the memo line of your check or a note with cash donations. We are very grateful for your support!